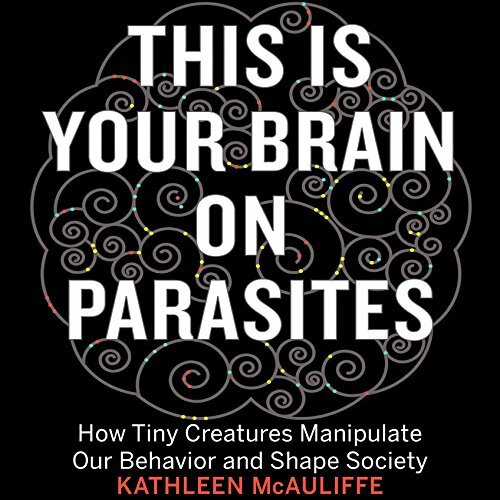 A riveting investigation of the myriad ways that parasites control how other creatures - including humans - think, feel, and act. These tiny organisms can live only inside another animal, and, as McAuliffe reveals, they have many evolutionary motives for manipulating their host's behavior. Far more often than appreciated, these puppeteers orchestrate the interplay between predator and prey. With astonishing precision, parasites can coax rats to approach cats, spiders to transform the patterns of their webs, and fish to draw the attention of birds that then swoop down to feast on them. We humans are hardly immune to the profound influence of parasites. Organisms we pick up from our own pets are strongly suspected of changing our personality traits and contributing to recklessness, impulsivity - even suicide. Microbes in our gut affect our emotions and the very wiring of our brains. Germs that cause colds and flu may alter our behavior even before symptoms become apparent. Parasites influence our species on the cultural level, too. As McAuliffe documents, a subconscious fear of contagion impacts virtually every aspect of our lives, from our sexual attractions and social circles to our morals and political views. Drawing on a huge body of research, she argues that our dread of contamination is an evolved defense against parasites - and a double-edged sword. The horror and revulsion we feel when we come in contact with people who appear diseased or dirty helped pave the way for civilization but may also be the basis for major divisions in societies that persist to this day. In the tradition of Jared Diamond's Guns, Germs, and Steel and Neil Shubin's Your Inner Fish, This Is Your Brain on Parasites is both a journey into cutting-edge science and a revelatory examination of what it means to be human. ©2016 Kathleen McAuliffe (P)2016 Audible, Inc. Chilling, gross yet oddly fascinating and engaging. I adore the writing style and overall performance. highly recommend. Most people with science focuses will tend to put their focus on a pedestal, and tend to lean towards it being the most important facet of most situations-microbiologists being no exception or course. This book is similar-while its not noxious, as its focus is on parasites they tend to be on that pedestal which is fair enough. I do find some explanations here interesting, and some delving into certain parasites is appreciated but as a science major I felt like it was lacking in depth on certain topics that I wanted to see more detail on, but C'est la vie. The microbiome section is a bit standard, but theres some good information regarding most of the other stuff-even if some of the conclusions in the book are a bit too uncautious in their assertion. Enjoyed it regardless, worth a look especially if you're not as into science and want to know about parasites. What would have made This Is Your Brain on Parasites better? Less reliance on unrepeated or unrepeatable studies and more focus on those with more substantial evidence for, OR at least disclaimers when using some studies as being more fringe. Would you ever listen to anything by Kathleen McAuliffe again? What character would you cut from This Is Your Brain on Parasites? nice popular overview at beginning that gets too general, moralistic, dull, and political at end. Takeaway #1: Evolution has ways of making means to an end become ends in themselves. Many hunters find plentiful prey chiefly because parasites spread more easily due to the relationship. Gut bacteria may even have been so intimately involved with the evolving gut and brain that we can model eating as evolving as an end in itself, divorced from nutritive needs of the organism. Takeaway #2: The biological and cultural evolution of disgust has shaped society more than you might think, growing from a way of managing parasites and disease into an influential aspect of moral sense. This part of the book was probably reaching too far though, citing studies which hadn't replicated well or hadn't established mechanisms. The narrator was decent but put the emphasis on the wrong word a number of times. Loved it--technical but conversational. Ending went into a lot of psychology/history, and got a little repetitive, almost to the point of sounding like the author was trying to be persuasive. Otherwise worth the read! I found the sociological implications lacking substance and value, which brought the overall quality of the book down. I would have preferred the book stick to the scientific study of parasites verses the lacking knowledge of their effects on humans. But the chapters covering the topic are a step in the right direction. Good blend of medical and psychological studies and theories. Narrator is easy to listen to. Totally a must read for biology nerds. I couldn't stop listening. It touched on so many biological reasons for the development of social behaviour that has influenced all our lives. The topics of THIS IS YOUR BRAIN ON PARASITES, yesterday's Audible Daily Deal, are parasites, germs, good gut bacteria, disgust, moral reasoning and judgment, and infections. So the range of topics is much broader than the title indicates. The content is both interesting and informative. During the final 90 minutes of the book goes totally off topic with a weird discussion of the impact of disgust on political and religious beliefs. I do not understand why the author decided bringing her socialist and atheistic beliefs into this book about science. In doing so she tries to use her science to explain why those who differ from her political and religious beliefs are morally inferior. She puts her argument as reason over disgust. I wish I had stopped listening 7 hours into this book.